Lamingtons are little sponge cakes which are traditionally coated in chocolate and desiccated coconut. Colonial cooks in Australia used to use the lamington recipe to freshen up stale cake, and these sweet treats are named after Lord Lamington, an Australian Governor General. Lamingtons are well-loved all over Australia and New Zealand. Any kind of cake can be used to make lamingtons, such as pound cake, butter cake or simple sponge cake. It is best to prepare and cook the cake one day ahead of frosting the lamingtons, because fresh cake is more delicate and you don’t want it to crumble or fall apart when dipping it into the thick frosting. In this recipe we are getting creative with the cake mixture, adding some matcha green tea powder to the batter for a hint of colour and delicate flavour. We are also making a matcha frosting to complement the cake. Matcha is a premium green tea powder which can be made into tea or used in recipes. It is rich in fibre, antioxidants, chlorophyll and various nutrients. It also contains L-theanine, which is an amino acid believed to relax the mind. Matcha green tea powder offers a distinctive, delicious taste, and the matcha flavour goes especially well with the coconut. Enjoy this tasty Australian treat with a cup of tea or coffee, or serve it for dessert. Grease a 20cm baking tin and line it with parchment paper. Preheat the oven to 190 degrees C. Beat the eggs with the caster sugar and salt until you have a thick, creamy mixture. Now sift in the flour along with the matcha and baking powder. Fold in the vanilla extract and melted butter. Transfer this batter into the prepared baking tin and bake for about 25 minutes, or until set. Let the cake rest in the tin for 5 minutes, then cool it on a wire rack. The following day you can cut the cake into 20 squares. Now it’s time to make the frosting. Sift the icing sugar with the matcha green tea powder, and then whisk in the water and melted butter. You might need to adjust the amount of water, because you need quite a thick mixture, but not too thick to be able to dip the cakes into it. Dip a lamington square into the frosting mixture to completely coat it, then roll it in desiccated coconut. Put the finished lamington on a wire rack to dry, and repeat with the rest of the cakes and the rest of the frosting mixture and coconut. Slice the lamingtons in half and add raspberry jam and whipped cream on one side before closing them again to serve. 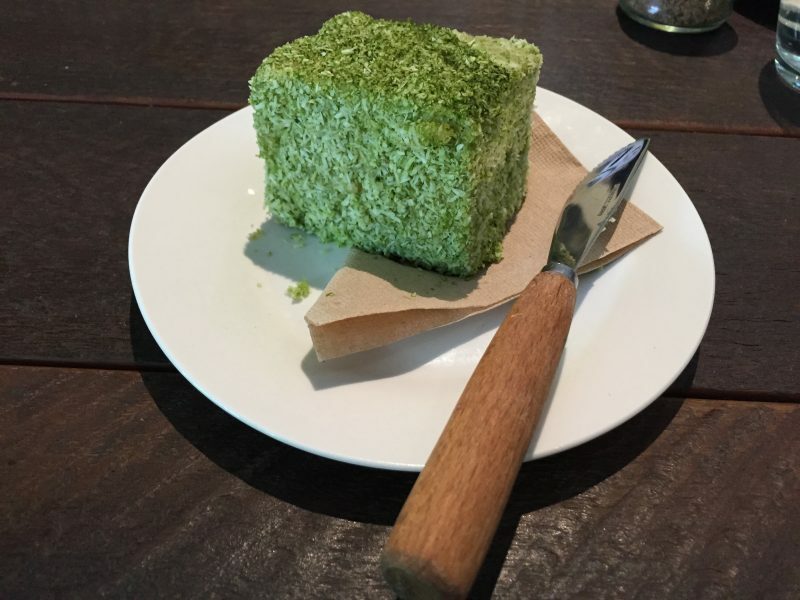 This recipe makes 20 matcha lamingtons.